Impressive and varied performances from the young actor Dulquar Salman will definitely strengthen his position in the Malayalam film industry. As you already know, Dulquar Salman surprised many by delivering two back to back hits starting with his debut film 'Second Show' and then in the super hit 'Ustad Hotel.' 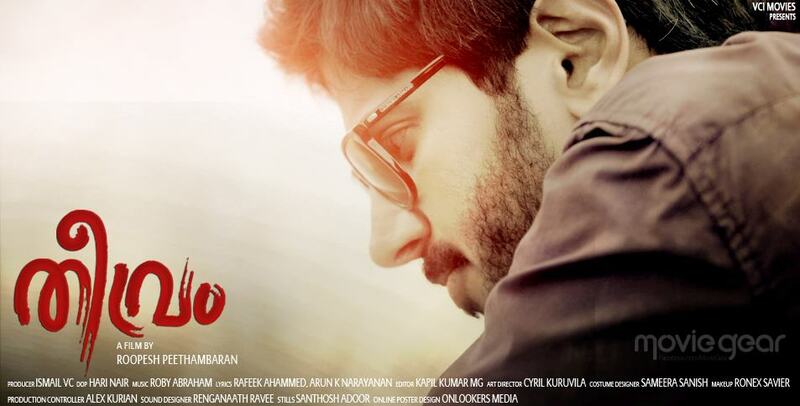 Theevram - Dulquar Salmaan's new movie is directed by Roopesh Peethambaran and produced by VC Ismayil. I went to watch 'Theevram' because there is an expectation that has been set from Dulquar Salman's previous films. The fact that he is cutting away the typical 'star son moulds' and daring enough to experiment with debut directors and varied genres is sort of reassuring to Malayali film goers like me who want to see a positive change in the Malayalam film industry. 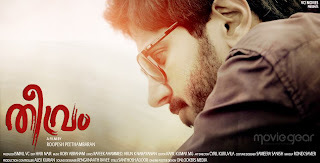 Theevram is a modern, smartly crafted and well scripted revenge story that begins with a crime taking place and its investigation officer Alexander (starring Sreenivasan) donning the role of an ethical, compassionate and responsible police officer. Sreenivasan makes us laugh with his comical expressions, fear of violent scenes, dead bodies and the sight of blood that is enough to make him puke on the spot. But he's damn good at his job and that's the element of surprise. Dulquar plays the role of an aspiring young music director called Harshavaradhan who seems to have a bizarre routine, living in a rented house, staying very low profile and teaching a little girl piano classes. But beneath it all, you can sense that he is up to something dark and sinister. Here comes the let down: the first half of the movie itself reveals that he is a sadistic killer. A film is always about relationships. Without strong relationships and an interesting romantic angle, it is difficult for a film to be convincing. Given that this film is about revenging the death of a woman that Harsha loves, it goes without saying that Dulquar Salman makes no effort at romance in this movie. There is no chemistry with the heroine. This is the part where it becomes evident that he is an actor who is very conscious of doing 'romatnic scenes' naturally. Not just in this movie, but in the previous two fiilms as well, Dulquar Salman's romantic scenes are almost clinical, lacking in depth and passion in portrayal. There is a serious lapse in the narrative between the first half of the movie and the second half. While the first half of the movie gets you totally glued to it, the second half is predictable and pointlessly violent by showing the flash back long after the climax is over. That doesn't make sense for a film maker. There is nothing left in the second half to keep you in your seat. What could have made 'Theevram' better? This movie could have been better if it had been well-researched, providing some kind of insight and statistics into the dangers and crimes against women who work and travel late hours and how many cases are reported, solved, taken to justice etc. The team of cops could have been used to bring in the big picture and thereby make it more socially relevant than just a one-off case. By solely focusing on revenge, the opportunity to showcase a larger and more relevant picture is lost. I agree that a movie need not be solution-oriented but while tackling a very serious crime that has relevance for all women who are either working late hours or traveling late, there should have been a couple of suggestions proposed by the Police who are investigating this case for the sake of all women. It could have cited useful guidelines to companies that employ women to work late hours. Or, the film could have shown or mentioned actual companies that do take the safety of the women employees more seriously. The lack of broad focus and detailed research has crippled the true potential of this film. Given the fresh and talented actors supporting the film, Theevram could have been much more effective than this. However, Dulquar Salman delivers well.